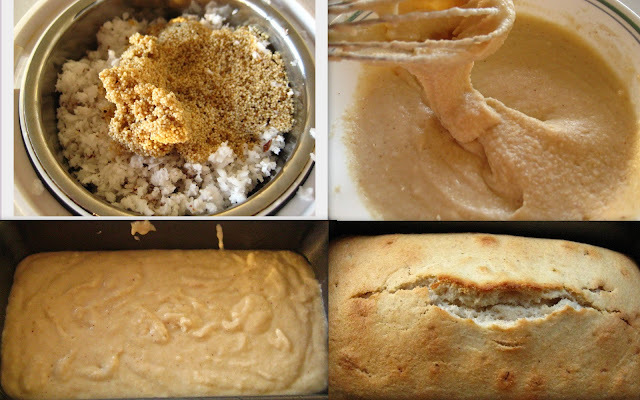 Hello friends, here is a different, easy and tasty bread recipe for you all. I took the basic idea of this recipe from a cook book, but not followed the step to step procedure as in the book. I did some changes in the ingredients. I skipped adding Soy Milk ( was in the original recipe), I somehow don't like the flavor. You can substitute the regular Milk with Soy Milk and some other flavors if you like. Give it a try. Have fun. Preparation time:2 hr 20 min. Soak the Poppy seeds for 1 hr. Then grind the soaked Poppy seeds with Coconut and about 3/4 cup Milk into smooth paste. Take Sugar and Butter in a bowl and mix well. Then add All purpose flour, Baking powder, baking soda, ground mixture, crushed Cardamom and salt to taste, mix very well. Now add the remaining Milk and mix well. Now grease the loaf pan with little Oil or Butter, pour the mixture. In the mean while pre- heat the oven at 350 degree F for 15 min. Now place the loaf pan in center of the oven and bake for 55-60 min. After 55-60 min, insert a knife or fork through to check if the bread is evenly baked. If the dough sticks to the knife, bake again for 3-4 min. Allow to cool for 10 min. Serve with a cup of hot Tea or Coffee. 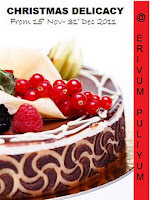 I am sending this Post to Christmas Delicacy event, hosted by Julie. Sending this post to Food of the Month contest hosted by Food Corner. Delicious n very unique recipe..using poppy seeds in cake..yummy n soft!! Thanx for sharing it with my event ..
Do send me the mail in details of your recipe as per the announcement page. You have such a wonderful space here - with yummy recipes!I absolutely loved this coconut-poppy seed bread.This sounds like a very new idea and must taste gorgeous!I'm following you too and hope to catch on with all those interesting recipes:)Nice meeting you. @Amy thank you, @ Teena thank very much for the award, I will grab it. @ sudha thank you..